We all have our morning rituals, the idiosyncratic routines without which we spend the rest of the day feeling slightly off. Personally, although I have learned to live largely without caffeine these last couple of years, and my drinking alcohol in the morning is limited to the occasional mimosa, I find it very, very difficult to begin my day without some kind of baking, preferably still slightly warm from the oven. During the recent heat wave in our city, it took me several days of being out of sorts and saying ferocious things to anyone I met who dared utter the words, “we have air conditioning, but we prefer not to use it unless we really need it,” before I realized that a large part of my attitude problem had to do with eating a cold breakfast every morning. Necessity being the mother of invention (and greed being an incredibly powerful motivator), I decided to try to come up with a warm weather-friendly strategy: rather than giving up the waking and baking altogether, the trick was to make up a recipe so easy and fast that the kitchen barely had time to heat up before I was pulling some yummy thing out of the oven. With the help of my willing family and what must be the hardest-working ceiling fan in the GTA, I came up with these muffins. And I have to tell you that, even though the temperature is more moderate now than it was last week, I still can’t get enough of them. In a food processor, combine bananas, oil, eggs, vanilla and apple juice concentrate and process until smooth. In a small bowl, whisk together flour, baking soda, baking powder, and espresso powder. Add flour mixture to food processor and process until all ingredients are combined. Scrape batter into a large mixing bowl and fold in chocolate chips. 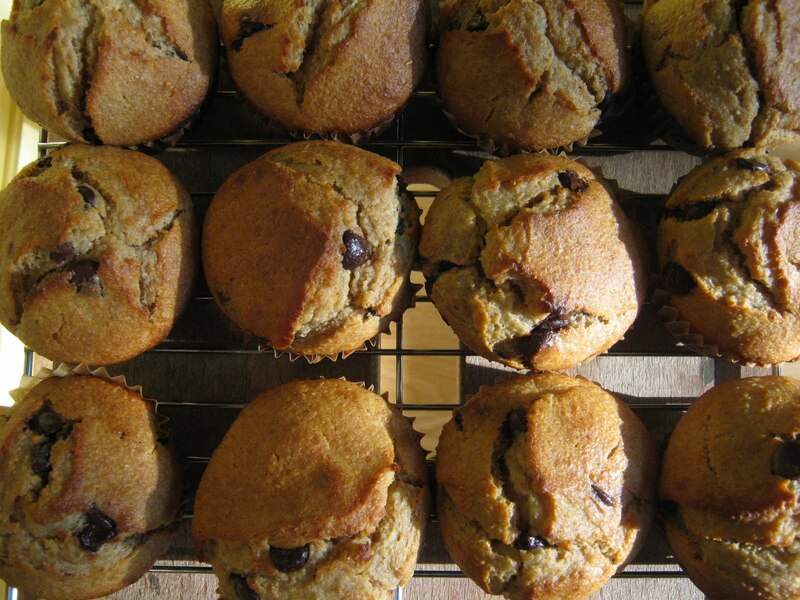 While oven is preheating, line a 12-cup muffin tin with paper cups. 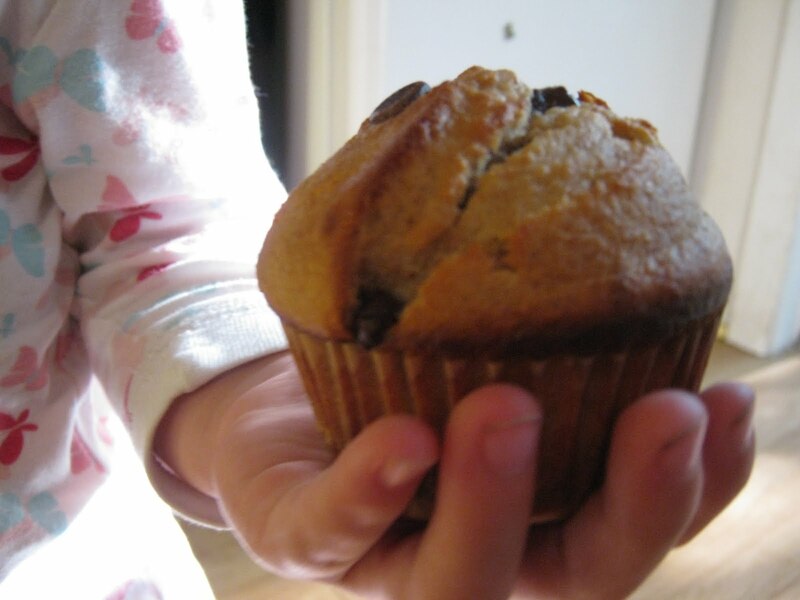 Divide batter evenly among muffin cups, and bake 17 – 18 minutes. Remove from heat (and turn oven off immediately!) and cool 10 minutes or so in pan before transferring to a wire rack. Serve immediately, or allow a little time to cool.